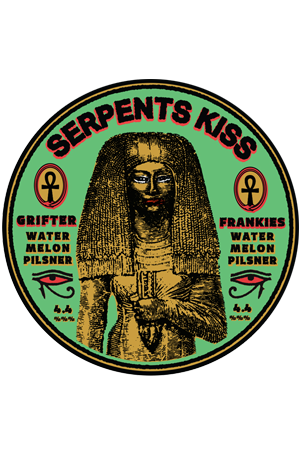 Serpent’s Kiss began life as a one-off beer, brewed for Sydney Craft Beer Week with the team at Frankies Pizza. But it clearly struck a chord with drinkers because when the Grifter brewery in Marrickville opened to the public a couple of months later, people were still asking for it. Being obliging hosts, they brought it back and it swiftly became the most popular beer pouring at the brewery. The success of an intended one-off beer isn’t altogether unusual, but what is here is the style of beer: watermelon pilsner. That said, using watermelon in beer shouldn’t be particularly strange when you consider the country’s reigning Champion Beer is Feral’s Watermelon Warhead. But where the Warhead is barrel-aged, sour and tart, Serpent’s Kiss is less funk and more fresh. Being a pilsner, there’s nowhere for extra ingredients to hide and the watermelon duly shines through on the light lager base. It makes for a very clean, very refreshing but also very interesting beer and you can understand why it’s proven such a hit over the hotter months. Yet, despite the reappearance, it’s not something you should expect to see pouring at the brewery all the time; when we asked brewer Glenn Wignall about the decision to make it for a second time, he almost winced at the memory of having to slice up the 40 or so watermelons that were added to the fermenter – but it’s hard to imagine another summer passing at the brewery without it making a comeback.